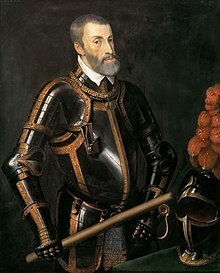 Charles V[a] (24 February 1500 – 21 September 1558) was Holy Roman Emperor (1519–1556), King of Spain and ruler of the Spanish Empire (as Charles I, 1516–1556), Archduke of Austria (as Charles I, 1519–1521), and ruler of the Habsburg Netherlands (1506–1555). 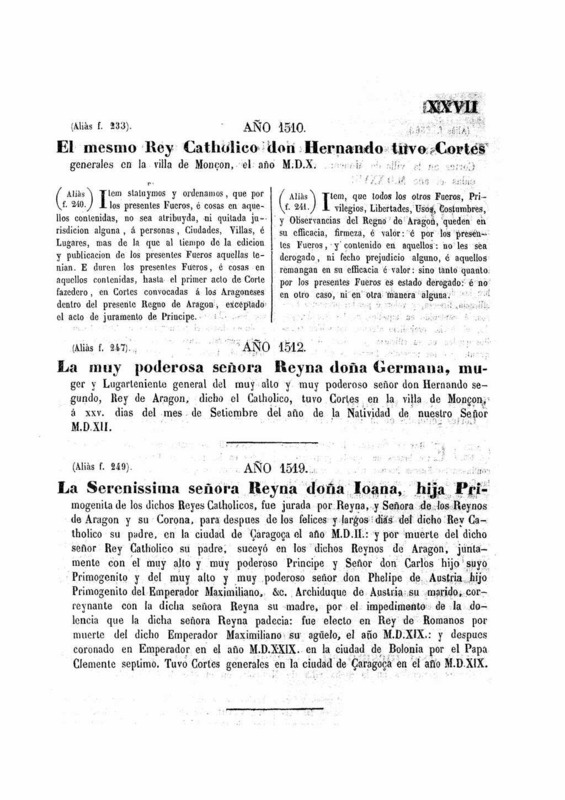 The Spanish conquest of Peru and Mexico and the German colonisation of Venezuela both occurred during his reign. 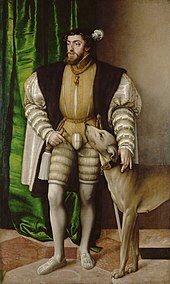 Charles V revitalized the medieval concept of the universal monarchy of Charlemagne and travelled from city to city, with no single fixed capital: overall he spent 28 years in the Habsburg Netherlands (primarily Brussels), 18 years in Spain (notably Toledo and Extremadura) and 9 years in Germany. 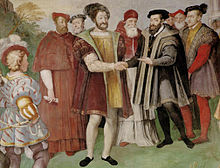 After four decades of incessant warfare with the Kingdom of France, the Ottoman Empire, and the Protestants, Charles V abandoned his multi-kingdoms project with a series of abdications between 1554 and 1556 in favor of his son Philip II of Spain and brother Ferdinand I of Austria. The personal union of his European and American territories, spanning over nearly 4 million square kilometres, was the first collection of realms to be defined as "the empire on which the sun never sets". 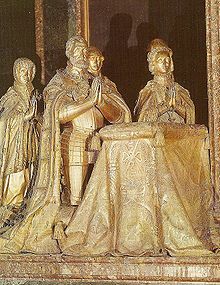 Charles was the heir of three of Europe's leading dynasties: Valois of Burgundy, Habsburg of Austria, and Trastámara of Spain. As heir to the House of Burgundy, he inherited areas in the Netherlands and around the eastern border of France. 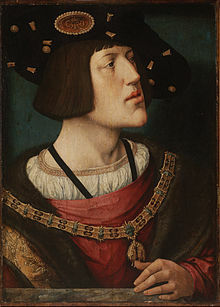 As the head of the House of Habsburg, he inherited Austria and other lands in central Europe and was also elected to succeed his grandfather, Maximilian I, as Holy Roman Emperor. 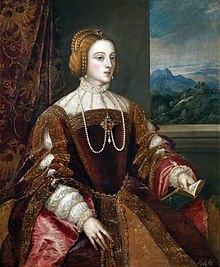 As a grandson of the Catholic Monarchs of Spain, both from the Spanish House of Trastámara, he inherited the Crown of Castile, which was developing a nascent empire in the Americas and Asia, and the Crown of Aragon, which included a Mediterranean empire extending to southern Italy. 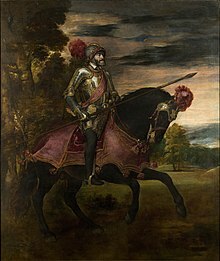 Charles was the first king to rule Castile and Aragon simultaneously in his own right, and as a result he is sometimes referred to as the first king of Spain. 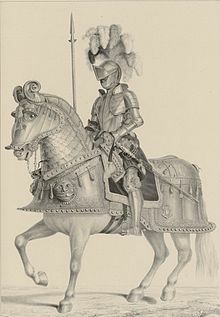 [b] The personal union under Charles of the Holy Roman Empire with the Spanish Empire was the closest Europe has come to a universal monarchy since the time of Charlemagne in the 9th century. This page was last edited on 22 April 2019, at 07:14 (UTC).